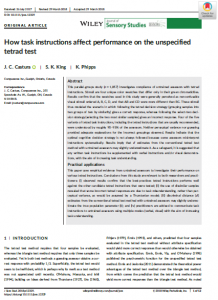 This parallel‐groups study (n = 1,857) investigates compliance of untrained assessors with tetrad instructions. Stimuli are four unique color swatches that differ only in their green chromaticities. Results confirm that the swatches used in this study were generally perceived as nonconfusable visual stimuli ordered A, B, C, D, and that AB and CD were more different than BC. These stimuli thus modeled the scenario in which following the tetrad decision strategy (grouping samples into two groups of two by similarity) gives a correct response, whereas following the select‐two decision strategy (selecting the two most similar samples) gives an incorrect response. Establishing the consumer relevance of a sensory difference is essential to reach a conclusion of ‘similarity’ or ‘difference’ between products. 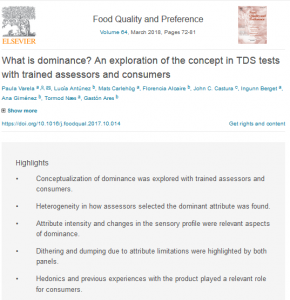 Rousseau and Ennis (2013) propose conducting a designed same-different study using a Thurstonian-derived model to obtain discriminal sensory distances (d’) and the consumer-based threshold tau. The manner in which “no preference” responses have been treated in the E1958 Standard Guide for Sensory Claim Substantiation has evolved between 1998 and the current (2016) guide. For example, the 1998 guide proposes that an interviewer present consumers with a forced-choice preference question, and accept a “no preference” response from consumers who indicate that they do not have a preference. 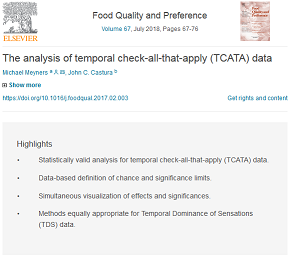 Temporal check-all-that-apply (TCATA) extends classical check-all-that-apply (CATA) by adding a temporal dimension to the evaluation. 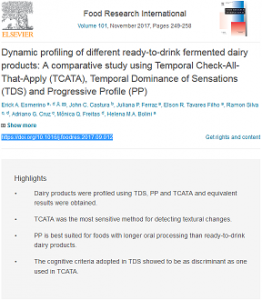 From a data analysis point of view, TCATA data are similar to Temporal Dominance of Sensations (TDS) data but differ in that more than one attribute can be selected at any time point. Procedures for analyzing TCATA data can hence be generalized from methods for CATA as well as for TDS. A graphic theoretical approach is applied to investigate perception dynamics. 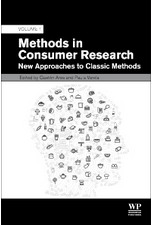 Methods for Consumer Research, Volume One: New Approaches to Classic Methods brings together world leading experts in global consumer research who provide a fully comprehensive state-of-the-art coverage of advances in the classical methods of consumer science. The book touches on the latest developments in qualitative techniques, including coverage of both focus groups and social media, while also focusing on liking, a fundamental principle of consumer science, consumer segmentation, and the influence of extrinsic product characteristics, such as packaging and presentation on consumer liking. 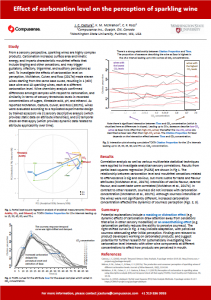 statistical methods we use in the analysis of sensory and consumer science data. Explore the latest in our sensory research.